Are you a regular viewer of the blockbuster television series Baby Daddy on ABC? Then the handsome Derek Theler, who plays the recurring role of Danny Wheeler, needs no introduction. Derek Theler is an American film and television actor and model, who also appeared on Princess Rap Battle, where he played the role of Huntsman. The short film was released on Youtube on 6 April 2016. He will also be a part of the cast for the upcoming web series, Ninjak Vs the Valiant Universe in 2017, where he would portray the character of ‘X-O Manowar’. Born on 29 October 1986 in Fort Collins, Alaska, United States of America, Derek Theler grew up with his parents. Throughout his childhood, he loved riding motorcycles and grew up playing sports. As a child – at age 3 – he was diagnosed with Type 1 Diabetes. He attended the Colorado State University in Fort Collins, Colorado. Derek began his acting career when he got several minor roles in TV shows in 2009. These shows include The Middle, Cougar Town, and The Hills. Derek Theler auditioned for Captain America but failed to land the role. He also appeared as a model in TV commercials, due to his great physique. In 2009, he landed a much coveted Coke Zero commercial, after which he appeared in a campaign for State Farm, in which he played a “hot guy” with a dark side. Subsequently, he also appeared in commercials for big hitting companies like Nike, Kayak.com, Arby’s, and Verizon. Much later, in 2012, he landed his first true big role, when he was cast as a character on ABC’s Baby Daddy. He plays the role of Danny Wheeler on Baby Daddy. The same year, Derek Theler starred as Riggins in a web show titled Project S.E.R.A. after which he appeared in a parody, titled Chicago Sanitation. In 2015, Derek Theler was cast as Chase Walker in the movie Shark Killer, which was released on 16 June 2015, through digital download. Theler also starred as Jordan in the Christmas movie titled How Sarah Got Her Wings. The movie was released on video on demand, and on digital HD on 1 November 2015. How Sarah Got Her Wings premiered on Ion Television on 6 December 2015. In 2016, he also appeared in Secret Summer, for the role of Jake. The movie was released on 12 April 2016. In 2017, Theler acted the role of Chris in Brotherly Love, a short film he did with Krista Kalmus. The same year, he landed the role of Craig Hollis/Mister Immortal in the upcoming New Warriors, a series from the Marvel Cinematic Universe. Aside from acting, Derek Theler also writes. He wrote and executive produced a short film titled Intrusion. Tall, handsome and stunningly dashing, Derek Theler is something of a fantasy to his female fans, who admire him a lot. He isn’t married but is known to have been in a romantic relationship with several ladies – celebrities themselves. Earlier in his career, in 2010, he dated actress Meredith Giangrande. They lasted two years before they broke it off in 2012. The next year, February 2013, he was spotted on several dates with actress Chelsea Kane, after they had grown close together during the shooting of the Baby Daddy series. When the rumor mill started turning, they admitted to dating, but they didn’t last for more than a couple of months, breaking up in April 2013. He started a relationship with TV star Christina Ochoa. They had met on a TV series they did together, with several friends and journalists referring to her as his unofficial wife. 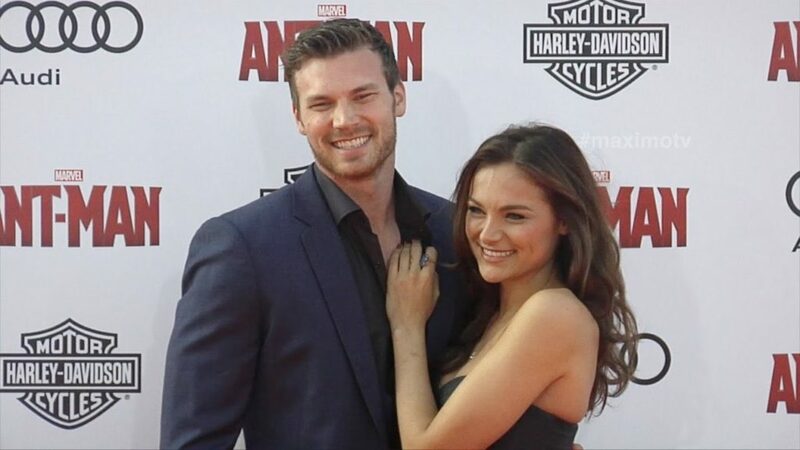 He proposed to Christina Ochoa in the later part of 2013, and she accepted his proposal the very next day. In 2016, however, they broke up following several misunderstandings. According to rumors, they broke up after Derek Theler started acting as a gay. Rumors have it that he is gay, although he hasn’t said anything on that account. In May 2016, he started dating Lisa Marie Summerscales. Lisa is Derek Theler’s present girlfriend, and they seem to be going steady and strong. Best wishes to the couple. Derek Theler is a very tall man, at 6 foot 5 inches. He weighs 99kg or 218 pounds. He has an attractive body and works out regularly to keep fit. Derek Theler’s net worth is estimated to be well over USD $3.4 million dollars. He made his money from sponsorship rights, advertisements, endorsements, and a host of features. He also lives a luxurious lifestyle.